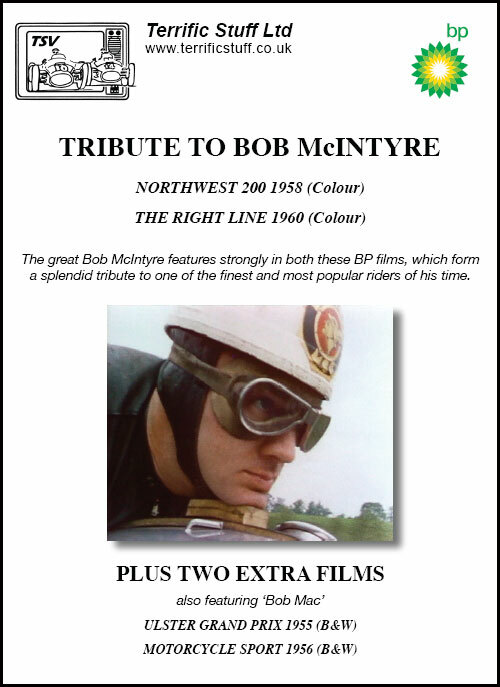 This DVD is a compilation of all the Motorcycle Sport films from the famous BP Archive. Bearing in mind that some of these films are now 50 years old, the quality is remarkably good. Both the ‘North-West ‘200’ 1958’ and ‘The Right Line 1960’ are in colour and ‘The Ulster Grand Prix 1955’ and ‘Motorcycle Sport 1956’ are in wonderful ‘period’ black and white. Much of the commentary comes courtesy of Graham Walker, Murray’s father. One of the joys of this DVD is the variety of venues and motorcycling sport it covers. We get to see road racing at Port Stewart and Dundrod; circuit racing at Cadwell Park and Solitude, near Stuttgart; trials riding from Wales and Scotland and motocross from Hawkstone Park. We also get to see other riders such as Mike ‘The Bike’ Hailwood, Geoff Duke and John Surtees. As a real bonus we are taken on-bike around Oulton Park for two laps with Bob McIntyre himself. This is quite an eye opener not only because of the quality of the footage but also to see just how bumpy and dangerous the tree-lined Cheshire circuit was in 1960. Robert McGregor McIntyre is remembered with great affection by his fans - he was a great racer and true hero. In many ways he was a two-wheeled version of the great Stirling Moss! Sadly Bob died after an accident at Oulton Park in 1962 when he was just 33 years old. The Scottish Classic Motorcycle Racing Club hold an Annual Bob McIntyre Memorial meeting at East Fortune Raceway, near Edinburgh.